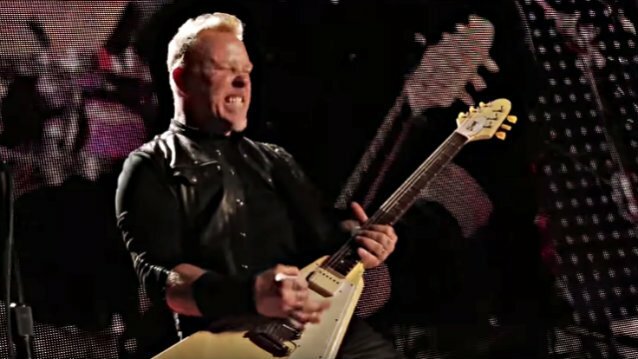 METALLICA has released a performance video for its song "Now That We're Dead", shot during the 2017 "WorldWired" tour. Check it out below. "Now That We're Dead" is taken from METALLICA's latest album, "Hardwired... To Self-Destruct", which was certified platinum on April 12 by the RIAA (Recording Association Of America). The platinum certification reflects a million equivalent album units, which blends traditional album sales, tracks sold from an album and on-demand audio and video streams. The recent gain in "Hardwired… To Self-Destruct" sales is owed mostly to a concert ticket/album bundle sale redemption promotion with the band's stadium tour that went on sale on February 17. Redemptions of albums included with the purchase of a concert ticket register as a sale in the week the customer redeems/receives the album. "Hardwired… To Self-Destruct" debuted as expected at No. 1 on The Billboard 200 album chart last November, selling 291,000 copies in its first week of release. The North American leg of METALLICA's "WorldWired" 2017 tour kicked off in Baltimore on May 10 and is hitting stadiums in 25 cities before winding down in mid-August. Support on the quartet's first North American trek since 2009 is coming mainly from AVENGED SEVENFOLD and VOLBEAT, with GOJIRA taking over for the latter group for the last six shows. The first European leg of "WorldWired" kicks off on September 4 in Amsterdam, The Netherlands and stretches through November. After a break, the trek will pick up again on February 10, 2018 in Bologna, Italy, and continue through May, finishing up in Helsinki, Finland.